Trained as a musician, Yoko Ono began creating artworks she called “instruction paintings” in 1961. These word-pieces rely on viewers for completion, either through their imagination or by literally following the directions Ono had written. Wish Tree, an ongoing project that has been installed in a variety of contexts, expands on these early works by soliciting and gathering wishes from those who encounter it. Presented across continents and decades, it has become an open creative collaboration between Ono and the more than one million people who have shared their dreams. 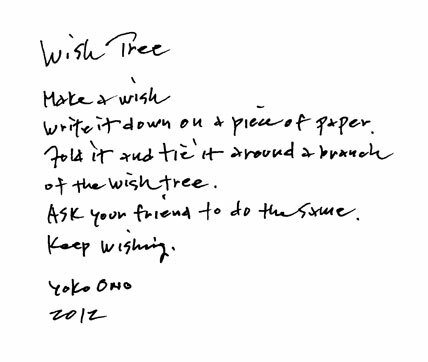 This Wish Tree is presented in recognition of Yoko Ono’s receipt of the Brooklyn Museum’s 2012 Women in the Arts Award.